We have been working nagenokata with our 8-12-year old kids. For simplicity we are doing it one-sided instead of alternating between both sides. Also, they are all very proficient at ukemi but to reduce the mat-banging, we threw a crashpad in the middle of the mat and we are landing uke on that pad. To land uke on the pad, you have to shift the line of the kata slightly to one side for the first throw. Then for the second you have to shift the line to the center of the crash pad. Then for the third throw, you have to shift the line to the other side of the crash pad. Then for the fourth, you're back in the middle of the pad and the fifth is back on the original side of the pad and the sixth is back in the middle. An instructor once told me that in judo and aikido, "nothing is random." That is, there are no patterns in the kata that are just accidental - they were all designed that way. 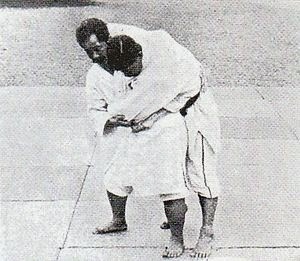 I have no way of verifying or disproving that, but it feels true - nothing is random in judo. I'm not sure what the significance (if any) is to this right-center-left-center-right-center pattern - but it sure was interesting - and it was cool that my 10-year old pointed that out to me! I'm growing a new crop of sensei to teach me judo!